Hittin ( , transliterated Ḥiṭṭīn or Ḥaṭṭīn) was a Palestinian village, located approximately west of Tiberias . The site of the Battle of Hattin in 1187, in which Saladin conquered most of interior Palestine from the Crusader, Hittin is a nationalist symbol for Arabs and Palestinians. Within the village lands is the shrine of Nabi Shu'ayb , venerated especially by the Druze as the tomb of Jethro. Ruled by the Ottoman empire from the 16th century until the end of World War I, Hittin became part of the British Mandate of Palestine. Captured by Israeli forces during the 1948 Arab-Israeli war, the village was depopulated, and currently lies in ruins. Hittin was located on the northern slopes of the double hill known as the "Horns of Hattin". Historically, the village was strategically and commercially significant because of its location overlooking the Plain of Hittin, which opens onto the coastal lowlands of Lake Tiberias to the east, and to the west, is linked by mountains passes to the plains of lower Galilee. These plains, with their east-west passages, served as routes for commercial caravans and military invasions throughout the ages. Tiberias is located northwest of Hittin, and other nearby localities include the depopulated villages of Lubya to the southwest and Nimrin to the west, and the surviving Arab villages of Eilabun to the northwest and Wadi Hamaam to the northeast. 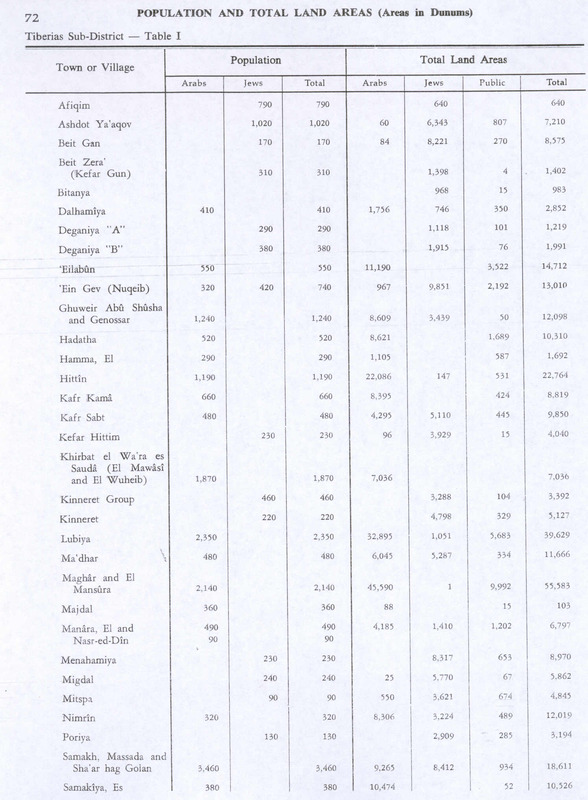 In Sami Hadawi's 1945 land and population survey, Hittin is recorded as having had a total land area of 22,764 dunams, of which 22,086 dunams were Arab-owned, 147 Jewish-owned and the remaining 531 being public property. The built-up area of the village was 70 dunams and was populated entirely by Arabs. 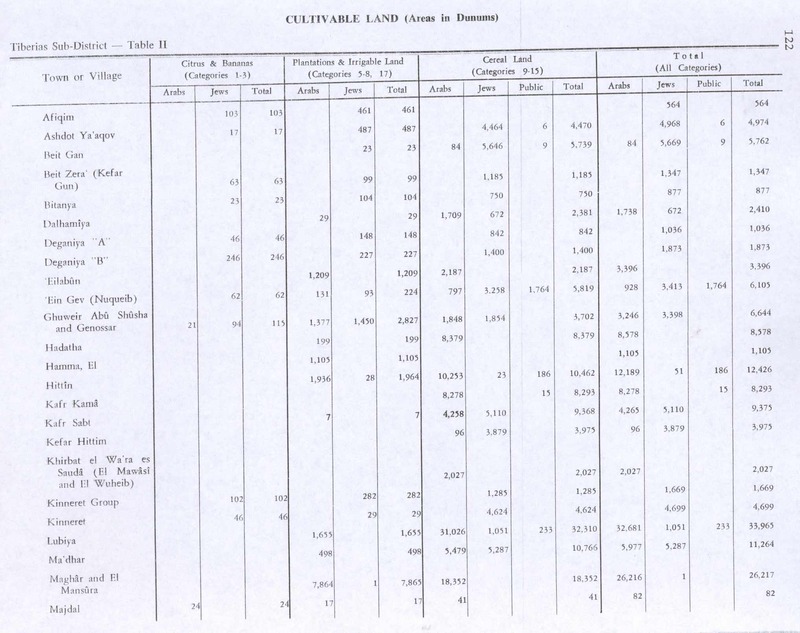 Cultivable land amounted to 12,426 dunams, while uncultivated land amounted to 10,268 dunams. Of the cultivated land, 1,967 dunams consisted of plantations and irrigable land, and 10,462 dunams were devoted to cereals. Hittin was an ancient settlement, archaeological excavation at the village have yielded pottery fragments from early Chalcolithic Period. The village may have been built over the Canaanite town of Siddim or Ziddim (Joshua 19:35), which in the third century B.C. acquired the Old Hebrew name Kefar Hattin ("village of grain"). It was known by the name Kfar Hittaya in the Roman period and served as a rabbinical seat in the fourth century. Hittin was located near the site of the Battle of Hattin , where Saladin defeated the Crusaders in 1187. The village is described as having been located near the base camp for Saladin's Ayyubid army, by Lieutenant-Colonel Claude Conder in Latin Kingdom of Jerusalem (1897). Describing the area, Conder writes: "The place was surrounded by olives and fruit trees, and a good spring — copious and fresh — flowed on the north-west into the gorge of Wadi Hammam. Hittin was also the place where numerous prominent figures from the Islamic period in Palestine were born or buried. Their names were linked to the village by a number of early Arab and Muslim geographers and chroniclers, including Yaqut al-Hamawi (d.1228) and al-Ansari al-Dimashqi (d.1327), who himself was called the Shaykh of Hittin. 'Ali al-Dawadari, the writer, Quranic exegetist, and calligrapher, died in the village in 1302. Arab and Muslim geographers and chroniclers frequently recall the Battle of Hittin and the tomb of Shu´aib (Jethro) in their descriptions of Hittin. Ali of Herat wrote (c. 1173) that both Jethro and his wife were buried there. Yaqut al-Hamawi writes that while there is another shrine near Arsuf that claims to be the tomb of Shu´aib, this is wrong. Sunni Muslims and Druze would make ziyarats and pilgrimages to Hittin to the tomb of Nabi Shu'ayb ("Prophet Jethro"). Druze would also hold an annual festival of pilgrimage that attracted members of their sect from other parts of Greater Syria, where their religious leaders would also discuss issues of importance to the Druze community. Hattin, as it appeared in a photo taken by H.T. 1596, Hittin was a part of the Ottoman nahiya ("subdistrict") of Tiberias under the liwa' ("district") of Safad . It paid taxes on a number of crops, including wheat, barley and olives, as well as goats and beehives. It is a village in the territory of Safad, consisting of 200 Muslim houses. It is like a flourishing little town (bulayda) abounding with vineyards, orchards and gardens. Water and air is refreshing. A large fair is held there once a week, when ten thousand men would gather from the neighbourhood to sell and buy. It is situated in a spacious valley, bordered on both sides by low rocks. There is a mosque, a public bath and a caravanserei in it. Richard Pococke visited Hutin in 1727, and writes that it is "famous for some pleasant gardens of lemon and orange trees; and here the Turks have a mosque, to which they pay great veneration, having, as they say, a great sheik buried there, whom they call Sede Ishab, who, according to tradition (as a very learned Jew assured me) is Jethro, the father-in-law of Moses." Johann Ludwig Burckhardt, a Swiss traveler to Palestine around 1817, described Hittin as a small village whose houses were built of stone. Edward Robinson visited Hittin in 1838, and described is as a small village, with houses of stone, while William McClure Thomson visited the village in the 1850s and noted the "gigantic" hedges of cactus which surrounded the village, and that the "Neby Shaiyib" shrine was celebrated as "a cure" for insanity. H. B. Tristram, who visited the place in 1863 during a village holiday, described the Hittin villagers with "bright faces and bright colours". He describes the "peculiar" costumes, consisting of "long tight gowns, or cassocks, of scarlet silk, with diagonal yellow stripes, and generally a bright red and blue or yellow jacket over them; while their cheeks were encircled by dollars and piastres, after Nazareth fashion, and some of the more wealthy wore necklases of gold coins, with a doubloon for pendant in front." By travelers' evidence, it seemed that the village was settled throughout the 19th century, and its inhabitants managed to use the fertile valley to grow many kinds of fruits, including olives, vines, oranges, lemons and figs. An elementary school was established in the village around 1897 under Ottoman rule. Early in the 20th century some of the land of the village, in the eastern part of the Arbel Valley was sold to Jewish funds, on which new settlements were established in 1910 (Mitzpa ) and 1924 (Hittin , which was later renamed Kfar Hittim. Disputes between the Arabs of Hittin and the Jews of both settlements were frequent, and in the 1929 Palestine riots some of the inhabitants of Arab Hittin joined forces with Arabs from other nearby villages to attack the Jewish Hittin, an attack that was repelled with the aid of British Police. Jewish Hittin was abandoned in 1933, and in 1936 was resettled and renamed. Hittin figured prominently in the consciousness of the Palestinian people, and its associations with Saladin's victory over the Crusaders made it an early and potent nationalist symbol. In 1932, local Palestinian leaders in Haifa associated with the Istiqlal party, as well as individuals like Sheikh Izz ad-Din al-Qassam, decided to commemorate the anniversary of Saladin's victory with a popular celebration. The Hittin Day celebration, held on August 27 of that year in the courtyard of a school in Haifa, was intended to be an anti-imperialist rally, and was attended by thousands of people from Palestine, Lebanon , Damascus , and the Transjordan . The speeches delivered at the event by Palestinian and Syrian Istiqlal party members centered around the revival and independence of the Arab nation and the importance of unity between Arab Muslims and Christians. By 1948, the village mukhtar was Ahmad ´Azzam Abu Radi. According to the villagers, they did not feel threatened by their Jewish neighbours at Kefar Hittim , who had approached them in November 1947, (in connection with voting over the United Nations Partition Plan), and assured the villagers they did not want war. By May 1948 the people of Hittin were very poorly armed. The village strength was estimated at 50 men, armed with 50 assorted rifles, with between 25 to 50 rounds of ammunition for each man. The villagers heard the news about the 1948 Arab-Israeli War on a radio belonging to the village mukhtar. They heard Radio Amman and Radio Damascus, among others, and grew increasingly concerned. However, for all practical purposes, they were uninvolved until June 9, when Jewish fighters attacked the neighbouring village of Lubya and were repulsed. Shortly after an Israeli armoured unit, accompanied by infantry, was advancing towards the village from the direction of Mitzpa . The attack was rebuffed, however, many of the villagers used up all their ammunition in that one confrontation, and "we were too poor to replace our bullets". During the night of July 16-17 almost all the inhabitants evacuated the village. Many left for Salamah, an area between Deir Hanna and Maghar, leaving behind a few elderly people and 30-35 militiamen. Hittin was occupied by the forces of the Golani Brigade during Dekel Operation on 17 July 1948 without a fight. During the following period the unarmed villagers often tried to return, but were chased off. In one instance the Golani unit ambushed a group of villagers as they entered Hittin -"to extract their belongings." The Golani unit chased the villagers away, killing some men and pack animals in the process. The villagers remained at Salamah for almost a month, but as their food-supply dwindled and their hope of returning faded, the group left together for Lebanon . Some of Hittin's former inhabitants also ended up in Nazareth . There were about 560 internally displaced Palestinians from the villages of Hittin and Alut in Nazareth in 1948, among a total internally displaced person (IDP) population of about 9,500 in the Nazareth area. The Israeli government was reluctant to have such a large concentration of IDPs in one place and a special ministerial committee recommended that those from Hittin and 'Alut be allowed to return to their villages, along with IDPs from Haifa , Acre , and Jaffa . However, the Israeli army objected to the order as is concerned Hittin, citing "security reasons". On the village lands of Hittin, the Jewish localities of Arbel and Kfar Zeitim were founded in 1949 and 1950, respectively. The Druze were given official custodianship over the shrine to Jethro in the 1950s, along with 100 dunam circumference. Their request to build housing to settle Druze soldiers who fought alongside Israelis against other Arabs in the 1948 war was denied. The Druze annual pilgrimage continues to be held and was officially recognized as a religious holiday by the Israelis in 1954. In front of shrine, there is a car-park which lies over a rubbish tip that is "gradually swallowing up the abandoned remains of the Hittin village," the built-up area of which remains uninhabited today. According to Ilan Pappé, 73 year old Abu Jamal from Deir Hanna planned to hold a summer camp for restoring the Hittin mosque, which, according to tradition, was built by Saladin in 1187 to commemorate his victory over the Crusaders. However, Abu Jamal was tricked by the Ministry of Education: its senior officials promised him that if he cancelled the camp, the ministry would donate money for the restoration work. After Abu Jamal had accepted the offer and cancelled the camp, the ministry sealed the site with barbed wire. Stones, including the foundation stone, were then removed by the nearby kibbutzniks who use the land for grazing. In February 2007, Eitan Bronstein, Director of Zochrot, an Israeli organization founded in 2002 to promote "recognition of the Nakba by the state, its residents and institutions, made an official complaint to the Regional Committee for Building and Planning in Israel's Northern District , regarding a new development plan being proposed by the Israeli authorities that would result in new construction expanding into what was once the village center of Hittin. Israeli planning has generally not involved building on what were the built up village centers of localities that were depopulated or destroyed in 1948, and Bronstein urged the Israeli authorities not to forgo the opportunity to transform sites like Hittin into "places of reconciliation" by taking the people who once lived there into consideration. On Land Day, March 30, 2007, Zochrot joined the displaced residents of Hittin in a visit to the remains of the village. 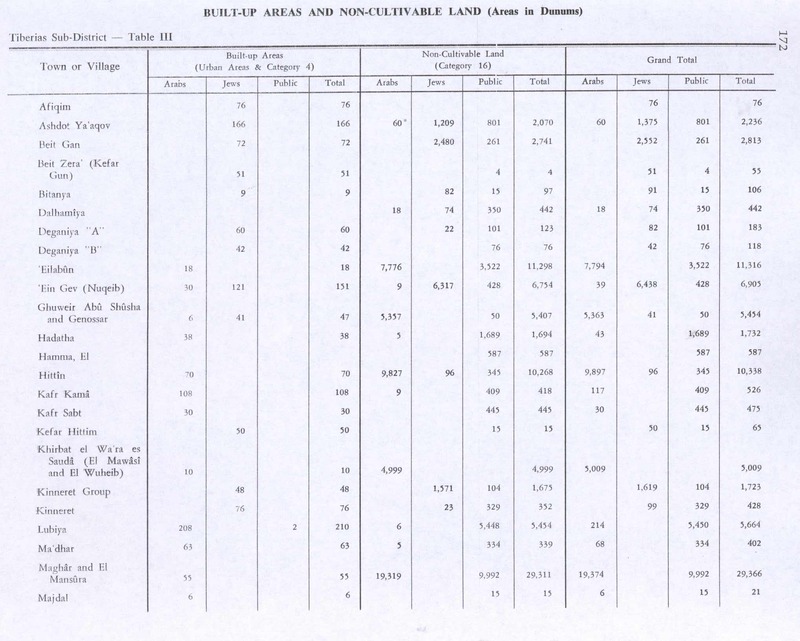 Built-Up Area and Uncultivable Land from Village Statistics of 1945: A Classification of Land and Area ownership in Palestine The Palestine Liberation Organization Research Center, p.72, p.122 and p.172. The village had a projected population of 1,380 in 1948. By 1948, the village had a few large and influential families; Rabah, ´Azzam, Shaiyabtah, Sa´adah, Sha´ban, and Dahabra. Refugee and their descendants numbered 8,477 in 1998.